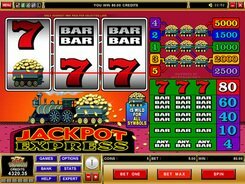 Jackpot Express is a non-progressive Vegas-style slot machine from Microgaming equipped with 3 reels and 5 paylines. Below the reels, you can see a steam locomotive pulling a wagon full of golden coins. Besides, a wagon is used in the symbols set adding a unique touch to the game. 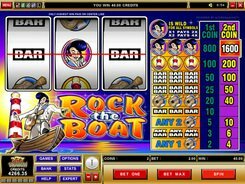 Along with the car, the slot employs the classical symbols of bars and sevens, making Jackpot Express a fairly easy to play option for rookies and slot veterans as well. 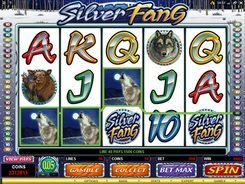 You can bet one coin per line and set a coin value from $0.25 to $5. Therefore, a total wager per spin varies from $0.25 to $25. To qualify for the top 5000-coin award granted for three wagon symbols, you need to meet two criteria. 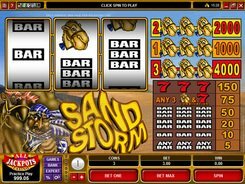 First, you must bet five coins per spin. Second, the winning three-wagon streak should land on line #5. 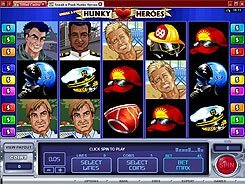 If so, your jackpot may climb up to $25,000! If the mentioned combo appears anywhere other than the fifth line, your reward will be a bit smaller at 1000 to 2500 coins, which is not so bad either. 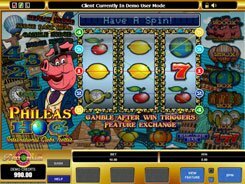 Being a classic fruit machine with a locomotive twist, the slot has no bonus features, yet it is a great slot to sit back and enjoy some nice winnings.